We previously posted about the UFO by Meroni and have seen heightened interest in this sensational product. 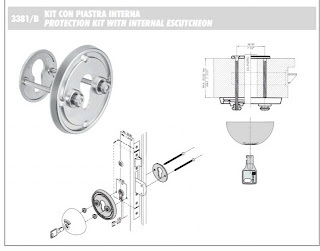 But I think it is fundamentally important for interested consumers to be aware that this product is essentially a lockable escutcheon as opposed to a stand alone product for operating a door mechanism. We are including an exploded view diagram that should help to provide a better understanding of the purpose of the UFO for entrance door applications. Yes, there are other applications for this product including automotive and gate and solid glass door situations however, essentially with all these applications, the UFO is designed to be operated from one side and one side only. For the purpose of a primary entrance, I highly advise against using this product because it will not meet the approved building code or life safety codes as measured by The International Building Code, for safety and egress in residential or commercial dwellings. NOTE: If you intend to make the actual key entry to your location better protected, this product is sensational. But it will mean you will need to carry both the UFO key and the actual room entry key to gain access to your secure location. Addalock is a modern interpretation of a product that was originally designed a significant number of years ago, to effectively add a degree of personal protection for concerned consumers. The product is designed to be applied simply and easily to any swinging door that uses an entrance type latch. Simple to install and perfect for travellers to add that little increase that can prevent potential home invasions while you are there. The State of Pennsylvania has recently filed a lawsuit against another company employing similar tactics to companies of similar ilk found all across the USA and some other countries as well. It is unfortunate that authorities in this country are being found inept and incapable of enforcing protection for legitimate, qualified technicians and companies trained deliberately in the locksmithing profession or in their abilities to protect the consumer from these charlottans. 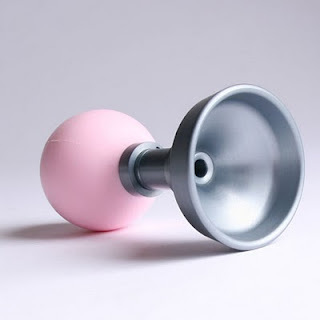 Dieter Volkers, a talented designer and inventor, has designed a unique product that is supposed to be a door knob. I think it is probably more like a retro design door bell. It is made from a soft polymer material that has the feel and texture of a cows horn or other items found on a cow. This product can be installed to any type of door and acts like a horn or door bell. Yes it is a novelty product, but one where simplicity is employed to provide unique product thoughts that perhaps unusually minded consumers might take an interest in. I just now returned from opening a house for a client who was locked out. I have worked as a locksmith for almost 30 years now and having picked opening very many locks in this time, sometimes I encounter a lock that just won't cooperate. I always try to find another method of entry prior to drilling the keyhole, like impressioning (making a key from outside), loiding a latch from outside where possible or in a worst case scenario, prying a window. Tonite, the front and back doors would not pick. I spent at least 30 minutes trying to pick the locks, with no success. Eventually I decided to use a method of entry, that very few locksmiths I know of, will try. I simply wedged the garage roller door in the middle at the top, opening a 1.5 inch gap and using a long strong wire, simply tripped the emergency release cord, unlocking the door allowing it to be raised easily. I have found that the greater majority of people tend to leave the door between the garage and the house unlocked. Unlocking the garage door is usually a simple task as it was tonite. It is an effective method of entry that virtually guarantees against damage. It does reinforce my advice to homeowners to always make sure to lock that door before leaving the house, as you can be sure, that if we locksmiths know these easy entry methods, you can be assured that people of ill intent, also know them. I had a very interesting discussion with a long serving locksmith in St Louis yesterday, about stocking lock products and other hardware. He indicated that the amount of stock he was continuing to keep in inventory is continuing to decrease annually, due to many consumers sourcing their product online, often substantially cheaper than he can sell them for. In many cases, I have been lucky to upsell clients to new product, when called to attend a service call. But the primary reason I was able to sell the products, was because I had it on hand at the time. Stocking many different product lines is difficult to please everybody, due to significant warehousing and retail prices. Most, if not all of our inventory is available online in some regard, elsewhere. This makes it increasingly difficult to compete in the marketplace. While, you can purchase products elsewhere (and sometimes at more competitive prices), should you? Often, specialist retailers like locksmiths, can only sell products at list price or similar due to competitive margins. But purchasing from a small retailer like a locksmith, often you will receive better warranty and service conditions. If quality is a requisite for you, I suggest shopping at your local locksmith might be the better option. I usually refrain from alerting customers to businesses that are indirectly and directly my competition, however in the case of C&R Lock Service Inc. I find their willingness to be accomodating and supportive to me at times of extreme benefit. Ron Schwarz, the owner is a long time experience and qualified tradesperson with a great many dedicated years providing service to the greater St Louis region. Located in Ballwin, MO 63011, their shop is like a stalwart of the past. Still operated largely, computer free, the old fashioned way continues to offer friendly, personalized and professional services to customers who demand more from their trades services people. Certainly many products are offered at the big box hardware stores, of which there 3 in very close proximity, but rarely will you find the attention to detail, the first class knowledge and experience of trained personnel or that obscure part to repair your product, rather than buying a new one. 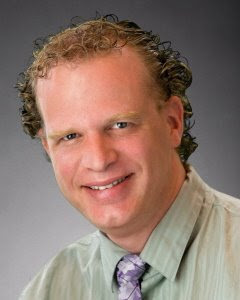 I have personally known Ron for the last 5 years and work with him to service West County clients. I always recommend clients who call me, to visit his store for duplicate keys rather than pay for a service call from a mobile service like me. It is beneficial and cost effective to visit an established, experienced shop and operator who can advise and provide products and services that the unfriendly big box cannot. One day, perhaps I too will have my own shopfront to offer services to passing trade. Until then I am very happy to recommend Ron as one of the most pleasant locksmith competitors in my area. St. Louis, MO: The United States Attorney’s Office announced today that the owners of a Florida based locksmith service were charged in a superseding indictment on multiple federal charges involving a scam to overcharge customers for locksmith services, as well as employing and harboring illegal aliens. According to the superseding indictment, Dependable Locks, Inc., headquartered in Clearwater, FL, managed a national network of locksmith technicians, operating from major population centers across the United States, including St. Louis. It also maintained a full-time staff of telephone operators and dispatchers, who were on duty 24 hours per day in Clearwater. The dispatchers received phone calls electronically forwarded from hundreds to thousands of telephone numbers listed nationwide for emergency locksmith services, all of which forwarded consumer calls to the call center in Florida. The dispatchers received the calls and the business dispatched locksmith technicians from the area of the call to respond. Many of the locksmith technicians working for Dependable Locks were aliens who were unlawfully present in the United States and were not authorized to work as locksmith technicians. The indictment alleges that the locksmith company engaged in deceptive marketing by purchasing directory listings and advertisements in cities across the United States that identified the business to the public as a set of local locksmith companies. The company’s listings used multiple business names, local phone numbers and fake local addresses that had no affiliation with the company. Phone calls to the listed phone numbers were automatically routed to the company’s call center in Clearwater, Florida. In addition, telephone operators for Dependable Locks were instructed by managers to mislead customers to believe that they would be charged around $54 for a car lockout, while the responding technician was instructed by managers to charge up to $179 for a lockout. Technicians used techniques such as accusing the consumer who objected to the overcharge of "theft of services," threatening to call the police, withholding the customer's keys or driver's license to compel payment or following the customer to an ATM machine to ensure payment. The locksmith technicians allegedly were allowed to split the profits of the fraudulently procured locksmith services with the company and were required to remit the company's share of the proceeds by regularly purchasing and shipping cash, checks and money orders to the Dependable Locks location in Clearwater, FL. "After more than a year of following numerous leads with ICE and the Missouri Attorney General's Office, we are pleased to see this case continue to progress," said Postal Inspector J.R. Ball of the St. Louis Field Office. He added, "The U.S. Postal Inspection Service is vigilant in investigating allegations where the mail or postal products are used to conceal or further a crime." DAVID PEER, Clearwater, FL; and ADAM OLIVKOVICH, address unknown, were indicted by a federal grand jury on one felony count of conspiracy to commit mail and wire fraud, five felony counts of mail fraud, one felony count of conspiracy to harbor illegal aliens for private financial gain and one felony count of engaging in a pattern of hiring unauthorized aliens. MOSHE AHARONI, Clearwater, FL, was indicted on one felony count of conspiracy to commit mail and wire fraud and one felony count of conspiracy to harbor illegal aliens for private financial gain. Conspiracy to commit mail and wire fraud carries a maximum penalty of five years in prison and/or a fine up to $250,000. Mail fraud carries a maximum penalty of 20 years in prison and/or a fine up to $250,000. Conspiracy to harbor unlawful aliens for private financial gain carries a maximum penalty of 10 years in prison and/or a fine up to $250,000. Engaging in a pattern of hiring unauthorized aliens carries a maximum penalty of six months in prison and/or a fine of $3,000 per alien. In determining the actual sentences, a Judge is required to consider the U.S. Sentencing Guidelines, which provide recommended sentencing ranges. This case was investigated by the United States Postal Inspection Service, the Missouri Attorney General’s Office and the U.S. Immigration and Customs Enforcement (ICE) Office of Homeland Security Investigations (HSI). Assistant United States Attorneys John Sauer and John Ware are handling the case for the U.S. Attorney’s Office. 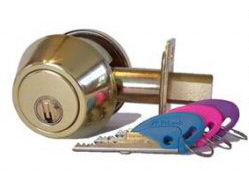 Altic Lock Service is a fellow member of "The Society Of Professional Locksmiths" located in Indianapolis, Indiana. Barry Campbell, owner of Altic Lock Service, is bonded, insured, and holds two locksmith certifications. He has received further manufacturer training from MAG Manufacturing, Ingersoll Rand Security Technologies, and Arrow Lock. He is a former Professional member of the International Conference of Building Officials. Barry began working as a locksmith over twelve years ago. Altic Lock Service is now in its sixth year of operation. We, at Master Key Systems America LLC - St Louis Locksmiths, like to recommend ethical and honest qualified professional locksmith companies, whom we know are trained professionals and can service discerning clients in their region. Choosing a reputeable company is very important to businesses and residents intent on providing first class professional and reliable services designed to protect business or family interests. The Society Of Professional Locksmiths is a USA based organization that sets a new standard for like minded professional locksmith companies and personnel. Last year, we decided to enroll in a very new payment processing service/product known as Square. What we like about Square's product offering, is it's simplicity in design, process, minimal fee structure and the fact that it's is the brainchild of local St Louis entrepeneurs. Simple to use, you insert the reader into your website connected smartphone, launch the app and swipe away. Enter a customers email address if they want a copy of the transaction emailed to them and that's it. This product is a blessing for small businesses everywhere because it takes the pain out of payment processing, puts power back in the hand of the vendor and reduces costs associated with time, labor and computer or peripheral GUI training. Do yourself and your business a favor, become a Square user and support another St Louis business while reducing your costs and inconveniences. Your clients and your profits will be happier and higher, for sure. Techies and early adopters rejoice, Blogger is now an Android app. This will hopefully make it easier to write new articles and posts of interest and posts them from the field. This is my first attempt at using the new app, so I hope it works well. 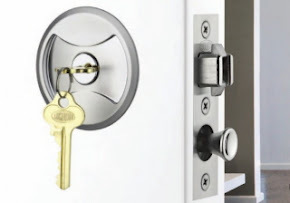 The new style Schlage Securekey Lock is the subject of much discussion recently and our post on Schlage Securekey Problems is one of this sites most popular posts. As popular is this sites post on Kwikset Smartkey Problems. The above video shows how easily the Schlage Securekey Lock can be bumped. It was believed that Schlage's motivation for releasing this lock was to thwart the bump key phenomenon and to also provide the owner with the ability to rekey their own lock, rather than calling the services of a professional locksmith. The quantity of issues with this product are mounting daily and this new example of the ease in bypassing/bumping or manipulating the lock, should be an indication to prospective buyers of what not to purchase. 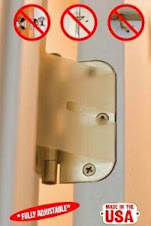 These locks are primarily available at big box hardware stores like Home Depot and Lowes. No self-respecting, ethical, honest retailer can offer this product for sale in my opinion. Here are the top 10 January's search stats that lead people to this website. 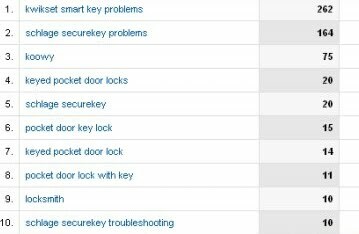 Interesting to note how many people seem to be searching for information on the Kwikset Smart Key Problems and the Schlage Securekey Problems. Our Keyed Pocket Door Lock continues it's amazing run in popularity, too.